My brother, his girlfriend, and my 10 year old niece came to visit us and shop at the local outlet mall. Last time I saw them all (at the Marin County Fair the 4th of July) I brought a huge picnic lunch for everyone but this visit I decided not to cook. I’d been wanting to try a new local Napalese/Indian place since it opened last year. They have a lunch buffet, but the timing didn’t work out, so we had dinner instead. Open Monday through Saturday – Lunch 11:30 am – 2:30 pm, Dinner 5:00 pm to 9:00 pm. Lunch buffet is $8.95 ($5 for kids) and dinner entrees run around $9-14. Lunch buffet $8.95 ($5 for children). My brother and his girlfriend got two chicken dishes, tandoori and tikka masala ($14), both of which they liked very much. Miriam had some too and kept asking for more of the masala sauce spooned over rice. Tikka masala is a protein of choice buried in a fragrant fenugreek sauce. 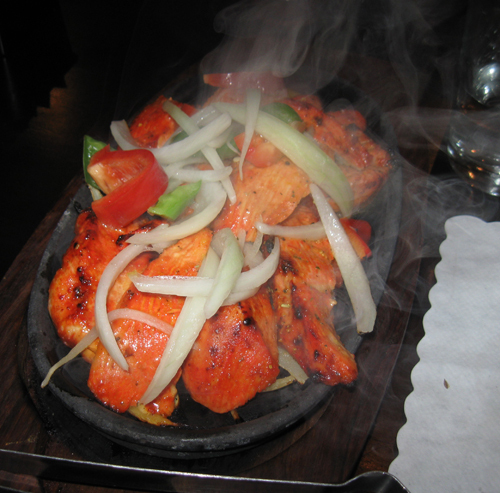 Tandoori has no sauce at all and the protein is baked in a clay oven then served on a sizzling hot platter with some vegetables. 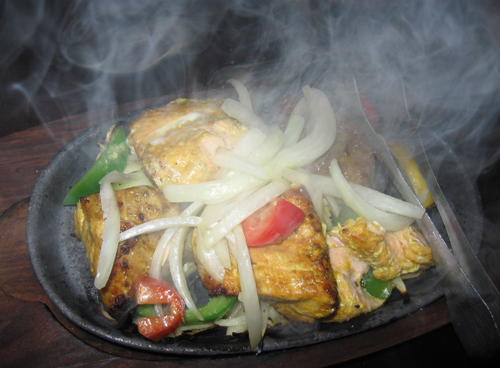 Michael and I got the mahi mahi tandoori and the fish was ever so slightly underdone, but still flaky and flavorful. That iron platter stayed hot for the entire meal and the vegetables left behind burned. At that point it occurred to me is what we should have done is to have let it cook for a couple more minutes then quickly transferred it all to our plates. I asked the staff about egg in their food and, fortunately for us, they don’t use very much. Only in the naan (bread). They told me most of their dishes have cream added and all of their breads are wheat-based. Because Miriam and I can both get away with occasional dairy and gluten, I didn’t worry about it. But another reviewer mentioned getting dishes made without cream, so it seems dairy-free is possible. 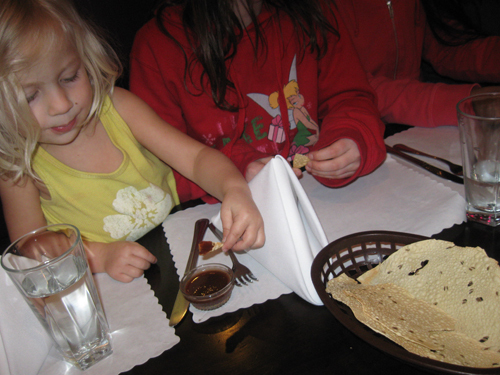 We started off with complementary crackers and a tamarind dipping sauce. They were light and crispy but had little flavor, despite being studded with spices. We got ourselves some roti, which is a plain wheat grilled bread (we ordered it without butter, which is how it usually comes) but that turned out to be a mistake. It was rather plain but hardened up just enough so you couldn’t soak up sauces with it. The basmati rice with peas ($1.50) was delicious. My brother’s family ordered aloo paratha ($3) which was a baked flatbread with potatoes and spices and raved about it all night. 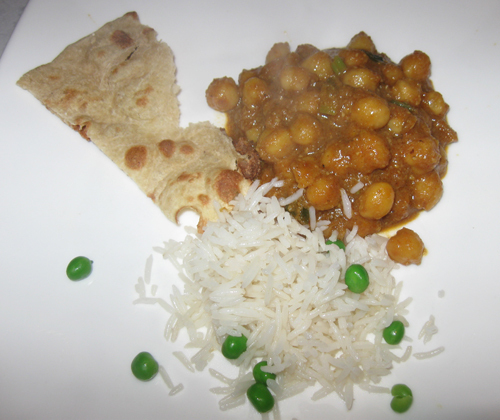 Michael’s and my other dish was channa amchaur, a beautifully spiced chickpea dish with enough sauce to justify eating the perfect (but carby) rice. I could have easily finished the bowl of it myself. Michael had an Indian beer and my brother some chai tea. We all skipped dessert. 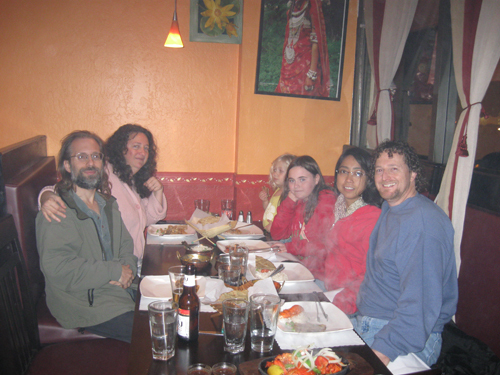 The inside of the restaurant is warm and inviting with no scents except for the lovely ones coming from the kitchen. Because the place is small, there is a single door to the outside and no way to sit away from the drafts. It was cold outside and we had to wear our jackets during the meal to stay warm. In summer it wouldn’t matter, and it has been unseasonably cold here (30’s and 40’s at night). I didn’t check out the restroom. The dining area is wheelchair accessible. I do look forward to coming again but next time I want to try the lunch buffet. Hopefully it will have more of those chickpeas.